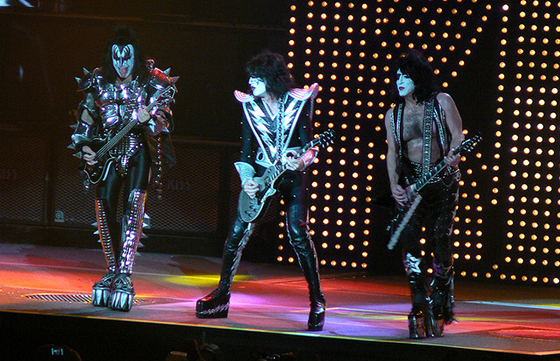 It’s time to Kiss and make up with Facebook ads. Image by Nick Ares via Flickr. It is often said that “common sense is not all that common.” This certainly holds true for marketers and small business owners who try to use Facebook advertising, fail, then call it quits. I mean, c’mon. 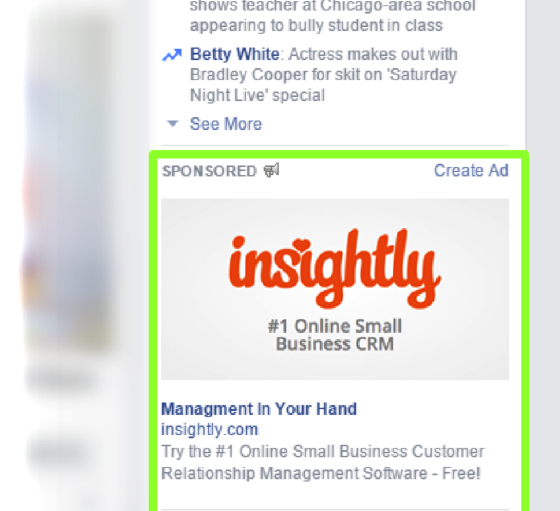 There are still individuals who believe that Facebook advertising as a whole doesn’t work for their bottom line. Some of you reading this are sitting on revenue goldmines but are too turned off by Facebook advertising to unlock that potential. I was the same way until I witnessed other marketers generating tens of thousands of dollars per month in revenue from Facebook campaigns. Jon Loomer, a Facebook advertising pro, recently generated 35x ROI on a single Facebook campaign. In 30 days, he spent $297.96 and generated $10,510.50 in revenue. Bam! If you are still interested learning what it takes to run a successful Facebook advertising campaign, take heed to these four tricks for maximizing ROI. 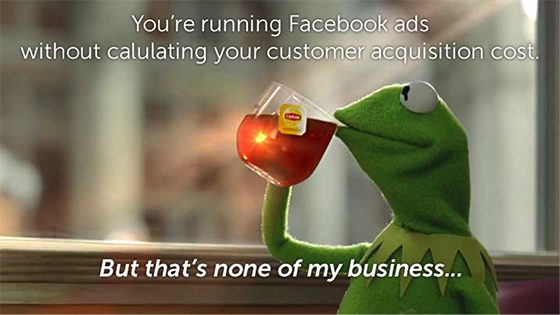 Before running your Facebook advertising campaigns, do you take a step back and calculate the cost of acquiring a customer? Without knowing your customer acquisition cost (CAC), you have no idea what type of ROI you are generating, or how to grow your campaign after it starts. Without that awareness, you are flying blind. Many marketers and business owners blame their failed advertising on Facebook’s algorithms and “not-so-hidden agenda” to make as much money as possible from advertising accounts. …But Facebook is not the culprit here. Facebook’s advertising platform is set up specifically for business owners and marketers to succeed, but Facebook will continually make money off of our ignorance if we don’t change up our approach. The core CAC equation seamlessly breaks down into three elements: the cost per site visitor, divided by the percentage of conversions into leads, divided by the percentage of conversions into buyers. To make sense of this, let’s apply this same equation to a recent campaign I ran for a travel company. Real example of FB campaign by DPA. Click for larger image. This screenshot displays a campaign timeline of approximately four months in which I was able to generate 3.5K clicks to a landing page for a cost of €964 (approx. $1221 USD). Broken down, that comes out to about $0.35 USD per click. That $0.35 figure is our Cost Per Visitor. This is where the variables come in. One of the biggest CAC variable costs (especially for B2B companies with long sales processes) is human involvement. Anything that requires a human touchpoint costs your company money – and that needs to be factored into your CAC. This could amount to anything from communication (customer support) to demonstrations and commissions. Even if many of the systems you have in place are largely automated, you still need to factor in merchant services and marketing/sales software used in the process – for example, software like Unbounce, Shopify, Salesforce, HubSpot and Freshbooks. Once you have the total cost of your variables, you simply divide that by the number of customers acquired. “Customers acquired” can be calculated in monthly, quarterly or annual durations – although most of your Facebook advertising campaigns won’t run for more than a few months at a time. Example variation cost: $1,000 (variable expense) / 3,500 (acquired customers) rounds to $0.29. Then add the $0.29 to your acquisition cost. I’d like to be brutally honest with you. Generating tons of traffic is not imperative to the success of your Facebook advertising campaign. I’ve seen people gain thousands of monthly visitors with Facebook advertising and generate zero ROI. Quit measuring your campaigns by how much traffic you drive to your site and start determining if the right people are going to your site and landing pages. How? By digging deeper into your KPIs! Things like the “lowest CPC,” the “most clicks” and the “lowest cost” shouldn’t be your primary objectives. Jon Loomer recently covered this in a very in-depth Facebook advertising case study. This first graph below would make the typical marketer think that lookalike audiences and interests audiences are the clear cut winners in this campaign because they have the most website clicks for the lowest cost. But when he followed the click all the way to the conversion, he found that targeting his fans produced the most conversions in the end. And that’s the goal, isn’t it? Just because a certain audience costs less doesn’t mean they will convert well in the end. If Jon Loomer would have stopped running ads to his fans because they cost more per click, he would have never generated as many conversions as he did with this campaign. He focused on the right traffic instead of trying to generate as much traffic as he possibly could. Wanna generate revenue with your Facebook ads? Stop measuring success by how much traffic you get. One of the biggest mistakes you can make with your Facebook advertising is to stop marketing after the click. Depending on how deep a customer is in your funnel, you need to nurture and engage them to expand your relationship. The fact is that most people won’t buy after their first interaction with your brand. The most successful FB advertisers in the world use email marketing to drive tons of revenue to their business after the initial advertising acquisition. Image source. Click for larger image. Tripwire: This is a micro product/service (like an ebook or trial) that allows you to begin the buyer relationship at a fraction of the core product cost. There is something magical about getting a customer to make that first small purchase, which increases your chances to sell your core product when the time comes. Core product: Your core products/services are the heart of your business. Most customers need nurtured prior to reaching this stage of your funnel – in the graphic above, customers only reach the core product offer if they’ve first purchased your tripwire offer. Profit maximizers: Customers only reach these offers if they’ve first purchased your core product or service, as these are items that complement that purchase. These could be add-ons, upgrades or complementary services. So, what does this product/service breakdown have to do with nurturing and engaging? By splitting up your products, you can segment your ads and corresponding marketing messages, resulting in personalized offers that leads to more conversions and lifelong customers. For each of the three product levels explained above, the customer goes through a series of engagement emails (typically 3-5 emails) until they convert further down the funnel. Great FB advertisers are nurturers and use email marketing to keep the conversation going. Your Customer Value Optimization funnel (outlined in the picture above) will greatly increase your customer lifetime value (CLV), which represents the net profit generated from the entire relationship with each customer. At the very least, you need to make sure you recover your CAC within 6-12 months per customer. 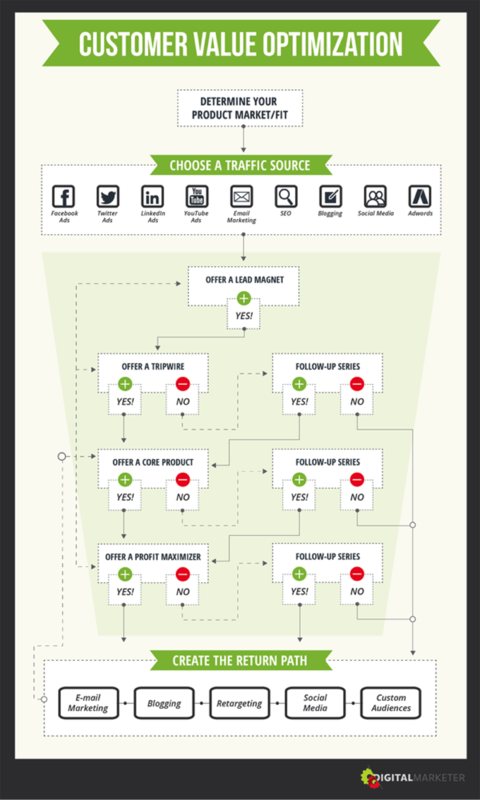 This is where retargeting is your best friend. By using Facebook’s Website Custom Audiences (WCA), you can retarget users in your advertising funnel who have yet to convert. When you set up a WCA, you will input a tracking pixel on any page, page section or conversion page that is relevant to your current campaign. From there, you can run retargeting ads that correlate with the location on your site that the user originally visited from your first Facebook ad. For example, if you originally ran an ad displaying a new product and set up a WCA tracking pixel that tracked all visitors to the landing page, you can then retarget them with bonus features, limited time offers or other benefits that would encourage them to convert. This type of retargeting creates crucial touch points that may be necessary to convert a potential customer. One word of warning: Be cautious of how many touch points you are creating with each customer. You do not want to turn off a potential customer by exhausting them with a high frequency of retargeting ads. Don’t give up on Facebook just yet – there is revenue to be made in your business through this beautifully simple platform if you just apply a little common sense. Derek Palizay is the Operator of Derek Palizay & Associates, a marketing and consulting group that focuses on inbound marketing. With clients around the world, DPA is creating and executing effective marketing strategies that people can believe in.